This article is about the scientific concept. For the substance of which all physical objects consist, see Matter. For the main liturgical service in some Christian churches, see Mass (liturgy). For other uses, see Mass (disambiguation). Mass is both a property of a physical body and a measure of its resistance to acceleration (a change in its state of motion) when a net force is applied. An object's mass also determines the strength of its gravitational attraction to other bodies. 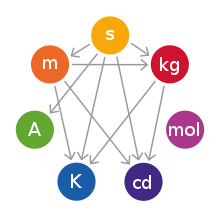 The basic SI unit of mass is the kilogram (kg). In physics, mass is not the same as weight, even though mass is often determined by measuring the object's weight using a spring scale, rather than balance scale comparing it directly with known masses. An object on the Moon would weigh less than it does on Earth because of the lower gravity, but it would still have the same mass. This is because weight is a force, while mass is the property that (along with gravity) determines the strength of this force. Quantum mass manifests itself as a difference between an object's quantum frequency and its wave number. The quantum mass of an electron, the Compton wavelength, can be determined through various forms of spectroscopy and is closely related to the Rydberg constant, the Bohr radius, and the classical electron radius. The quantum mass of larger objects can be directly measured using a Kibble balance. In relativistic quantum mechanics, mass is one of the irreducible representation labels of the Poincaré group. The first experiments demonstrating the universality of free-fall were—according to scientific ‘folklore’—conducted by Galileo obtained by dropping objects from the Leaning Tower of Pisa. This is most likely apocryphal: he is more likely to have performed his experiments with balls rolling down nearly frictionless inclined planes to slow the motion and increase the timing accuracy. Increasingly precise experiments have been performed, such as those performed by Loránd Eötvös, using the torsion balance pendulum, in 1889. As of 2008[update], no deviation from universality, and thus from Galilean equivalence, has ever been found, at least to the precision 10−12. More precise experimental efforts are still being carried out. Depiction of early balance scales in the Papyrus of Hunefer (dated to the 19th dynasty, c. 1285 BCE). The scene shows Anubis weighing the heart of Hunefer. Galileo had shown that objects in free fall under the influence of the Earth's gravitational field have a constant acceleration, and Galileo's contemporary, Johannes Kepler, had shown that the planets follow elliptical paths under the influence of the Sun's gravitational mass. However, Galileo's free fall motions and Kepler's planetary motions remained distinct during Galileo's lifetime. The primary difficulty with Mach's definition of mass is that it fails to take into account the potential energy (or binding energy) needed to bring two masses sufficiently close to one another to perform the measurement of mass. This is most vividly demonstrated by comparing the mass of the proton in the nucleus of deuterium, to the mass of the proton in free space (which is greater by about 0.239%—this is due to the binding energy of deuterium.). Thus, for example, if the reference weight m2 is taken to be the mass of the neutron in free space, and the relative accelerations for the proton and neutron in deuterium are computed, then the above formula over-estimates the mass m1 (by 0.239%) for the proton in deuterium. At best, Mach's formula can only be used to obtain ratios of masses, that is, as m1 /m2 = |a2| / |a1|. An additional difficulty was pointed out by Henri Poincaré, which is that the measurement of instantaneous acceleration is impossible: unlike the measurement of time or distance, there is no way to measure acceleration with a single measurement; one must make multiple measurements (of position, time, etc.) and perform a computation to obtain the acceleration. Poincaré termed this to be an "insurmountable flaw" in the Mach definition of mass.
. This shifts the explanandum of the value for the mass of each elementary particle to the value of the unknown couplings Gψ. A tachyonic field, or simply tachyon, is a quantum field with an imaginary mass. Although tachyons (particles that move faster than light) are a purely hypothetical concept not generally believed to exist, fields with imaginary mass have come to play an important role in modern physics and are discussed in popular books on physics. Under no circumstances do any excitations ever propagate faster than light in such theories—the presence or absence of a tachyonic mass has no effect whatsoever on the maximum velocity of signals (there is no violation of causality). While the field may have imaginary mass, any physical particles do not; the "imaginary mass" shows that the system becomes unstable, and sheds the instability by undergoing a type of phase transition called tachyon condensation (closely related to second order phase transitions) that results in symmetry breaking in current models of particle physics. ^ When a distinction is necessary, M is used to denote the active gravitational mass and m the passive gravitational mass. ^ Since the Avogadro constant NA is defined as the number of atoms in 12 g of carbon-12, it follows that 1 u is exactly 1/(103NA) kg. ^ The distinction between "active" and "passive" gravitational mass does not exist in the Newtonian view of gravity as found in classical mechanics, and can safely be ignored for many purposes. In most practical applications, Newtonian gravity is assumed because it is usually sufficiently accurate, and is simpler than General Relativity; for example, NASA uses primarily Newtonian gravity to design space missions, although "accuracies are routinely enhanced by accounting for tiny relativistic effects".www2.jpl.nasa.gov/basics/bsf3-2.php The distinction between "active" and "passive" is very abstract, and applies to post-graduate level applications of General Relativity to certain problems in cosmology, and is otherwise not used. There is, nevertheless, an important conceptual distinction in Newtonian physics between "inertial mass" and "gravitational mass", although these quantities are identical; the conceptual distinction between these two fundamental definitions of mass is maintained for teaching purposes because they involve two distinct methods of measurement. It was long considered anomalous that the two distinct measurements of mass (inertial and gravitational) gave an identical result. 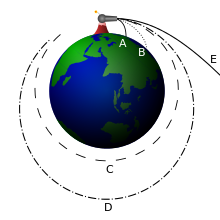 The property, observed by Galileo, that objects of different mass fall with the same rate of acceleration (ignoring air resistance), shows that inertial and gravitational mass are the same. 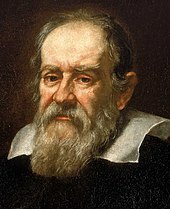 ^ At the time when Viviani asserts that the experiment took place, Galileo had not yet formulated the final version of his law of free fall. He had, however, formulated an earlier version which predicted that bodies of the same material falling through the same medium would fall at the same speed. See Drake, S. (1978). Galileo at Work. University of Chicago Press. pp. 19–20. ISBN 978-0-226-16226-3. ^ These two properties are very useful, as they allow spherical collections of objects to be treated exactly like large individual objects. ^ In its original form, Newton's second law is valid only for bodies of constant mass. ^ It is possible to make a slight distinction between "rest mass" and "invariant mass". For a system of two or more particles, none of the particles are required be at rest with respect to the observer for the system as a whole to be at rest with respect to the observer. To avoid this confusion, some sources will use "rest mass" only for individual particles, and "invariant mass" for systems. ^ For example, a nuclear bomb in an idealized super-strong box, sitting on a scale, would in theory show no change in mass when detonated (although the inside of the box would become much hotter). In such a system, the mass of the box would change only if energy were allowed to escape from the box as light or heat. However, in that case, the removed energy would take its associated mass with it. Letting heat or radiation out of such a system is simply a way to remove mass. Thus, mass, like energy, cannot be destroyed, but only moved from one place to another. ^ "The definition of mass". ^ "New Quantum Theory Separates Gravitational and Inertial Mass". MIT Technology Review. 14 Jun 2010. Retrieved 3 Dec 2013. ^ von Klitzing, Klaus (February 2017). "Metrology in 2019" (PDF). Nature Physics. 13 (2): 198. arXiv:1707.06785. Bibcode:2017SSPMA..47l9503L. doi:10.1360/SSPMA2017-00044. ^ "Draft of the ninth SI Brochure" (PDF). BIPM. 10 November 2016. pp. 2–9. Retrieved 2017-09-10. ^ W. Rindler (2006). Relativity: Special, General, And Cosmological. Oxford University Press. pp. 16–18. ISBN 978-0-19-856731-8. ^ Kane, Gordon (September 4, 2008). "The Mysteries of Mass". Scientific American. Nature America, Inc. pp. 32–39. Retrieved 2013-07-05. ^ Eötvös, R.V. ; Pekár, D.; Fekete, E. (1922). "Beiträge zum Gesetz der Proportionalität von Trägheit und Gravität". Annalen der Physik. 68 (9): 11–66. Bibcode:1922AnP...373...11E. doi:10.1002/andp.19223730903. ^ Drake, S. (1979). "Galileo's Discovery of the Law of Free Fall". Scientific American. 228 (5): 84–92. Bibcode:1973SciAm.228e..84D. doi:10.1038/scientificamerican0573-84. ^ Galileo, G. (1632). Dialogue Concerning the Two Chief World Systems. ^ Galileo, G. (1638). Discorsi e Dimostrazioni Matematiche, Intorno à Due Nuove Scienze. 213. Louis Elsevier. , translated in Crew, H.; de Salvio, A., eds. (1954). Mathematical Discourses and Demonstrations, Relating to Two New Sciences. Dover Publications. ISBN 978-1-275-10057-2. and also available in Hawking, S., ed. (2002). On the Shoulders of Giants. Running Press. pp. 534–535. ISBN 978-0-7624-1348-5. ^ Hooke, R. (1674). "An attempt to prove the motion of the earth from observations". Royal Society. ^ Turnbull, H.W., ed. (1960). Correspondence of Isaac Newton, Volume 2 (1676–1687). Cambridge University Press. p. 297. ^ Hawking, S., ed. (2005). Principia. Running Press. pp. 15ff. ISBN 978-0-7624-2022-3. ^ Whiteside, D.T., ed. (2008). The Mathematical Papers of Isaac Newton, Volume VI (1684–1691). Cambridge University Press. ISBN 978-0-521-04585-8. Retrieved 12 March 2011. 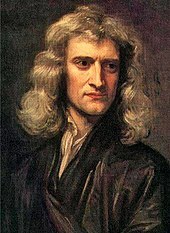 ^ a b c d Sir Isaac Newton; N.W. Chittenden (1848). Newton's Principia: The mathematical principles of natural philosophy. D. Adee. Retrieved 12 March 2011. ^ Cuk, M. (January 2003). "Curious About Astronomy: How do you measure a planet's mass?". Ask an Astronomer. Archived from the original on 20 March 2003. Retrieved 12 March 2011. ^ P.W. Bridgman, Einstein's Theories and the Operational Point of View, in: P.A. Schilpp, ed., Albert Einstein: Philosopher-Scientist, Open Court, La Salle, Ill., Cambridge University Press, 1982, Vol. 2, pp. 335–354. ^ Henri Poincaré. "Classical Mechanics". Chapter 6 in Science and Hypothesis. London: Walter Scott Publishing (1905): 89-110. ^ Taylor, E.F.; Wheeler, J.A. (1992). Spacetime Physics. W.H. Freeman. pp. 248–149. ISBN 978-0-7167-2327-1. ^ G. Oas (2005). "On the Abuse and Use of Relativistic Mass". arXiv:physics/0504110. ^ Okun, L.B. (1989). "The Concept of Mass" (PDF). Physics Today. 42 (6): 31–36. Bibcode:1989PhT....42f..31O. doi:10.1063/1.881171. Archived from the original (PDF) on 22 July 2011. ^ Rindler, W.; Vandyck, M.A. ; Murugesan, P.; Ruschin, S.; Sauter, C.; Okun, L.B. (1990). "Putting to Rest Mass Misconceptions" (PDF). Physics Today. 43 (5): 13–14, 115, 117. Bibcode:1990PhT....43e..13R. doi:10.1063/1.2810555. Archived from the original (PDF) on 22 July 2011. ^ Sandin, T.R. (1991). "In Defense of Relativistic Mass". American Journal of Physics. 59 (11): 1032. Bibcode:1991AmJPh..59.1032S. doi:10.1119/1.16642. ^ Hecht, Eugene (2006). "There Is No Really Good Definition of Mass" (PDF). Phys. Teach. 44 (1): 40–45. Bibcode:2006PhTea..44...40H. doi:10.1119/1.2150758. ^ Misner, C.W. ; Thorne, K.S. ; Wheeler, J.A. (1973). Gravitation. W.H. Freeman. p. 466. ISBN 978-0-7167-0344-0. ^ a b c Lisa Randall, Warped Passages: Unraveling the Mysteries of the Universe's Hidden Dimensions, p.286: "People initially thought of tachyons as particles travelling faster than the speed of light...But we now know that a tachyon indicates an instability in a theory that contains it. Regrettably for science fiction fans, tachyons are not real physical particles that appear in nature." ^ Tipler, Paul A.; Llewellyn, Ralph A. (2008). Modern Physics (5th ed.). New York: W.H. Freeman & Co. p. 54. ISBN 978-0-7167-7550-8. ... so existence of particles v > c ... Called tachyons ... would present relativity with serious ... problems of infinite creation energies and causality paradoxes. ^ a b Kutasov, David; Marino, Marcos & Moore, Gregory W. (2000). "Some exact results on tachyon condensation in string field theory". JHEP. 0010 (10): 045. arXiv:hep-th/0009148. Bibcode:2000JHEP...10..045K. doi:10.1088/1126-6708/2000/10/045. arXiv EFI-2000-32, RUNHETC-2000-34. ^ Sen, A. (2002). Rolling tachyon. JHEP 0204, 048. Cited 720 times as of 2/2012. ^ Gibbons, G.W. (2002). "Cosmological evolution of the rolling tachyon". Phys. Lett. B. 537 (1–2): 1–4. arXiv:hep-th/0204008. Bibcode:2002PhLB..537....1G. doi:10.1016/s0370-2693(02)01881-6. ^ a b Aharonov, Y.; Komar, A.; Susskind, L. (1969). "Superluminal Behavior, Causality, and Instability". Phys. Rev. 182 (5): 1400–1403. Bibcode:1969PhRv..182.1400A. doi:10.1103/PhysRev.182.1400. ^ a b Feinberg, Gerald (1967). "Possibility of Faster-Than-Light Particles". Physical Review. 159 (5): 1089–1105. Bibcode:1967PhRv..159.1089F. doi:10.1103/PhysRev.159.1089. ^ a b Peskin, M.E. ; Schroeder, D.V. (1995). An Introduction to Quantum Field Theory. Perseus Books. ^ Wang,Z.Y. (2016). "Modern Theory for Electromagnetic Metamaterials". Plasmonics. 11 (2): 503–508. doi:10.1007/s11468-015-0071-7. Wikisource has the text of The New Student's Reference Work article "Mass". L.B. Okun (2002). "Photons, Clocks, Gravity and the Concept of Mass". Nuclear Physics B: Proceedings Supplements. 110: 151–155. arXiv:physics/0111134. Bibcode:2002NuPhS.110..151O. doi:10.1016/S0920-5632(02)01472-X. David R. Williams (12 February 2008). "The Apollo 15 Hammer–Feather Drop". NASA. Retrieved 3 Dec 2013.